Last night at the 91st Academy Awards ceremony Samuel L. Jackson delivered an Oscar-worthy performance when he handed the gong over for Best Original Screenplay. In case you missed it, the Academy panel thought the writers of Green Book did the best job. The three-man team, who told the true story of a tour of the Deep South by African-American classical and jazz pianist Don Shirley and his driver Tony Vallelonga, consisted of Brian Currie, Peter Farrelly, and Nick Vallelonga. If you’d noticed a similarity between the surname of one of the non-fictional characters and one of the writers – Nick Vallelonga – you’d be right to. He helped construct the narrative, which is named for a mid-20th century guidebook for African-American travellers written by Victor Hugo Green, to help them find motels and restaurants which would accept their custom. Green Book – a film which has won other awards despite only receiving ‘generally favorable reviews’ on Metacritic – has been criticised for alleviating the societal pressure on white people to consistently fight racism and for historical inaccuracies. It seems the saving grace of the film is mainly down to the performances of the lead actors – Viggo Mortensen and Mahershala Ali. But Green Book is not the only reason you’d have heard of Nick Vallelonga. It’s the same bloke who once helped President Donald Trump spread false and Islamophobic accounts of 9/11 in November 2015, with a since-deleted tweet. In fact, Vallelonga deleted his Twitter account. 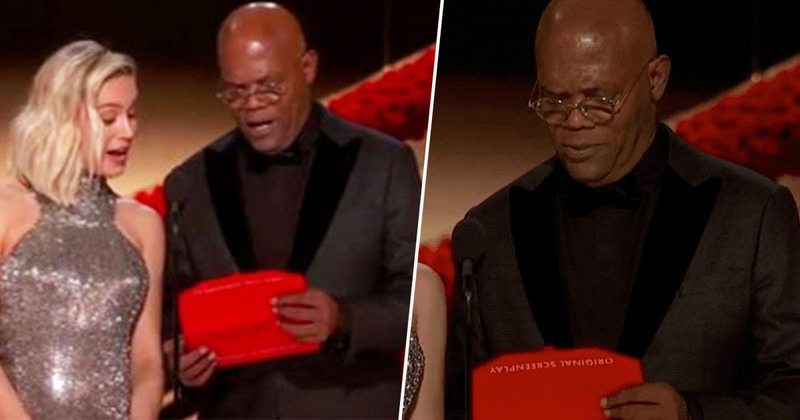 A lot of observers have noticed the comparison between that awkward moment and the joy with which Jackson read Spike Lee’s name in the Best Adapted Screenplay envelope for BlacKkKlansman. He couldn’t have been more excited… Or less subtle. Weirdly, the whole thing came full circle when President Donald Trump this morning accused Spike Lee of being ‘racist’ toward him during his acceptance speech. Wonder what Sam’s face will look like as and when he reads The Donald’s tweet. Give the man an Oscar.